only fear God and not humans, not exempting President Muhammadu Buhari, for any reason at all. 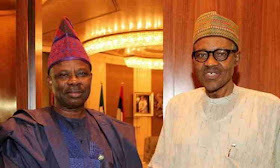 Amosun said God whose counsel or pronouncement cannot be altered by man, is the one he fears and nobody else. Amosun was reported to have made the comments while addressing leaders and members of All Progressives Congress (APC) during a stakeholders meeting last Friday at the party Secretariat in Abeokuta. Clarifying his earlier statement, he said, “You know this is our time as politician, a time when politicians will call black, blue. Yesterday I held a meeting with our people, and the way I started was that, I was brought up to fear God but only for me to see in the paper this morning that ‘Amosun says he fears God and Buhari’. “No, it is only God I fear, the one that is alive, the only one that will say ‘kufayakun’ and no one can change (it), that is the only God that I fear.